Cannabis consumers and other curious individuals around the world are waiting to see what researches will discover about the cannabis flower’s medicinal properties. A very complex plant, most consumers ingest cannabis based off of general assumptions of the medicinal qualities of the plant. One of the strongest assumptions is that cannabidiol or CBD is the one true medicinal cannabinoid found in marijuana and that the best CBD products are pure cannabidiol. Las Vegas dispensaries offer all sorts of cannabis products, including CBD isolates. However, a new study out of the Lautenberg Center for General and Tumor Immunology in Jerusalem has provided definitive evidence that pure CBD is not as effective at reducing swelling, which cannabidiol is particularly known for, as ingesting the full spectrum of cannabinoids offered in marijuana flower, or what is called the entourage effect. In this study lab mice were inflicted with swelling in their paws and multiple agents were applied to see which reduced the swelling the most effectively. Tested agents included a control, a CBD concentrate, a full cannabis flower concentrate, aspirin (an over-the-counter painkiller) and tramadol (a highly addictive prescription based painkiller). 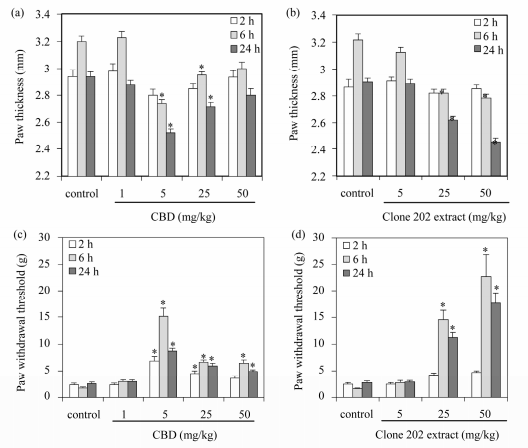 Results showed that the CBD isolated concentrate failed at being effective once a certain dosage was reached as opposed to the full spectrum cannabis flower concentrate which continued to reduce swelling the more the dosage was increased. 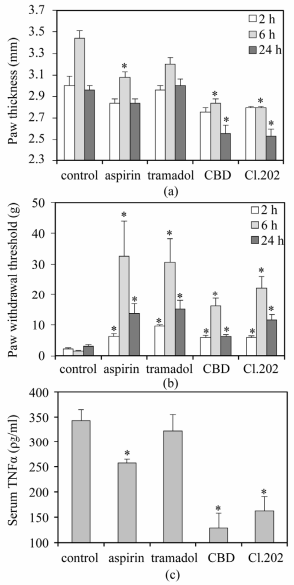 Both aspirin and tramadol performed poorly at reducing the inflammation relative to the cannabis concentrates. These findings should have significant implications for Las Vegas marijuana consumers looking to take advantage of the medicinal benefits of the the best CBD products. Perhaps the correct cannabis concentrates to reduce swelling are whole plant CBD oil products. One of the draws to CBD is there are no psychoactive effects after ingesting it and many consumers may worry that consuming even a whole plant CBD-rich oil extract could impair their mental clarity. These justifiable concerns certainly warrant further research but does not take away from the significance of these findings especially considering the comparison to traditional commercial drugs. The national opioid epidemic has reached unimaginable levels and prescription drugs like tramadol are major contributors to the problem. Findings such as these from the Lautenberg Center for General and Tumor Immunology in Jerusalem should indicate to the medical community that hard prescription drugs do not need to be prescribed in such volume when cannabis alternatives exist. The other significant far reaching implication of these findings is the clear identification of the unique medicinal properties of cannabis relative to traditional pharmaceutical drugs. Currently, marijuana is a Schedule 1 drug in the United States which makes any research here in the U.S. very restrictive since the classification claims cannabis is both dangerously addictive and has no known medical value. Tramadol has nothing to do with opiate addiction in america.